That was a quick experiment with brush "spriting", so it wasn't a commission or anything like that. So basically, it was for a scientific reasons. For what project are you making it? 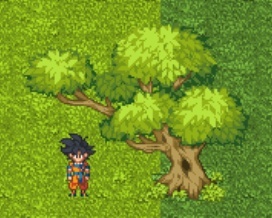 Something new from the upcoming DB project. To clarify everything: Yes, i did use Uncle's stuff without his permission, or rather without anyone's permission since i thought it was from RL tibia (i dont play it, dont know whats in there) or other open-source resource. Since then i've apologized Uncle and contacted him about this matter. I really like your stuff, but I'm a bit disappointed now... That grass is not new. I made it, and not for you. So, why would you use it like it's your own stuff? How about growing up?